Jurassic World was a big hit this weekend and an experience that will remind you of your inner child and love for dinosaurs will surface again. This movie is a direct sequel to the first which means the other sequels were completely erased which worked out in favor for the series. Jurassic World takes place 22 years after the first Jurassic Park and the incident that happened then. Throughout the movie you will notice references of the first and how they made this a better place for tourists to come check it out and be safer. Just like Disney World or other theme parks, the only way to keep people coming is to go bigger and better by creating new dinosaurs to grab more attention. 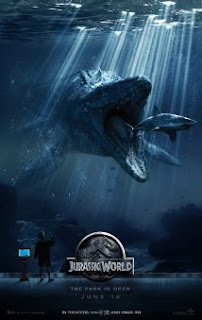 A new breed called Indominus Rex is created and besides being smart and cunning it has other traits too that place it at the top of the food chain. Can it be stopped? To face Indominus Rex, we meet a raptor trainer by the name of Owen (Chris Pratt) who imprinted himself on the raptors when they were babies so that he is seen as the alpha of the pack. His storyline is then caught up with Claire's (Bryce Dallas Howard). Her life being in charge of the whole park takes a dark turn when her two nephews visit. Zack (Nick Robinson), and Gray (Ty Simpkins) get lost and it's up to Claire and Owen to find them. The storyline was just as amazing as the first movie and although we didn't see any cameos of the first cast, you will love these new characters and the story behind each one. Aside from all that I've said, you will see dino vs dino and the last scene is pretty epic. The only way the new dinosaur created is gonna get beaten up is for other fellow dinos to join forces.